Scene from Hartsdale Pet Cemetery & Crematory: © Hartsdale Pet Cemetery & Crematory Would it be a bit easier on your loss of a pet if you knew that you could be buried with him or next to him? If so, you are not the only one who would get solace from this knowledge - not by any means. Americans are buried next to their cats, dogs... even iguanas, and more are preparing for their own inevitability by purchasing plots in advance right next to their pets. The International Association of Pet Cemeteries and Crematories told the United Kingdom's Press Association that nearly a quarter of pet cemeteries are accepting humans and that the demand is growing. Donna Bethune, the group's executive secretary. The Hartsdale Pet Cemetary, about 40 minutes north of New York City, gets 10 to 12 requests a year from owners wanting to be buried with their pets and, at Hartsdale, they are accommodated. About 700 persons have joined the 75,000 buried pets they loved. Hartsdale, which opened in 1896, is the first American pet cemetery, and it probably offers more services to the grief-ridden than most other pet cemeteries. If you choose to be buried with your pet, one or both of you will have to be cremated. Of course, this is not a very popular choice for burial, even today. When a pet is buried in a human cemetery with his owner, the pet has to be cremated and placed in the coffin with the owner. 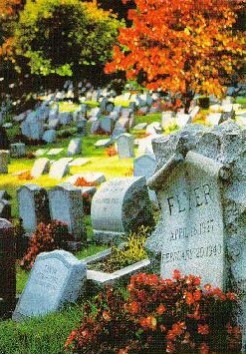 Is it irony or justice that in most pet cemeteries, humans must be cremated to be buried with their pets?